Willie Dale Ross is the son of William Montgomery Ross and Helen Josephine Ball. 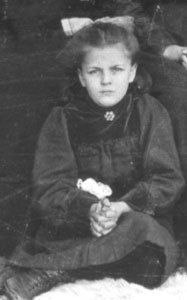 Naomi Maxine Ross is the daughter of William Montgomery Ross and Helen Josephine Ball. Don Dean Hoppus was born on 15 September 1927. He died in January 1985 at Blue Earth, Faribault Co., MN, at age 57. Betty Jane Ross is the daughter of William Montgomery Ross and Helen Josephine Ball. Photo courtesy of Martiele Sidles of Fullerton CA. [S12] 1900 (June 1) U.S. Census, Ellsworth, Emmet Co., IA, ED 76, Sheet 4A (stamped 43). [S3196] "rosburgs71", "Rosburg Family Tree," database made available on-line courtesy of "rosburgs71", https://www.ancestry.ca/family-tree/person/tree/81743224/person/38441635088/facts, database viewed 25 July 2017. [S3177] Gary Ball, "Gary Ball Family Tree," database made available on-line courtesy of Gary Ball, https://www.ancestry.ca/family-tree/person/tree/106783821/person/310053631069/facts, database viewed 19 July 2017. [S13] 1910 (April 15) U.S. Census, Lincoln, Emmet Co., IA, ED 90, Sheet 3B (back of stamped 254). [S14] 1920 (January 1) U.S. Census, Lake Fremont, Martin Co., MN, ED 121, Sheet 5B (back of stamped 104). [S15] 1930 (April 1) U.S. Census, Tenhassen, Martin Co., MN, ED 46-27, Sheet 5A (stamped 206). [S16] 1940 (April 1) U.S. Census, Silver Lake, Martin Co., MN, ED 46-28, Sheet 5B (stamped 287). [S3197] D. H. Miller, "Miller Family 2017," database made available on-line courtesy of D. H. Miller, https://www.ancestry.ca/family-tree/person/tree/107130327/person/430058117251/facts, database viewed 25 July 2017. [S1819] Minnesota Birth Index 1935-2002, made available by FamilySearch.org (Salt Lake City, Utah) on-line at http://familysearch.org, 2012; database courtesy of The Church of Jesus Christ of Latter-Day Saints. [S903] Find A Grave - A User-Contributed Listing of Cemeteries and Memorials; Find A Grave Founder Jim Tipton, 2009; online at http://www.findagrave.com/cgi-bin/fg.cgi?page=gs&, Tenhassen Cemetery, Ceylon, Martin Co., MN. [S903] Find A Grave - A User-Contributed Listing of Cemeteries and Memorials; Find A Grave Founder Jim Tipton, 2009; online at http://www.findagrave.com/cgi-bin/fg.cgi?page=gs&, Fairview Memorial Park Cemetery, Fairmont, Martin Co., MN. Donald Eugene Rosburg was born circa 1927 at MN.1 He was the son of Frank Fred Rosburg and Hattie Amanda Ball. Donald Eugene Rosburg married Bernice Irene Stade. Donald Eugene Rosburg died circa 1989. Bernice Irene Stade was born on 29 June 1928. 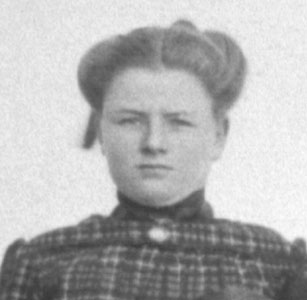 She married Donald Eugene Rosburg, son of Frank Fred Rosburg and Hattie Amanda Ball. 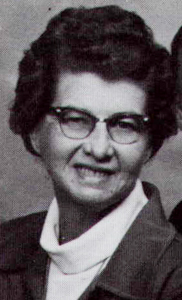 Bernice Irene Stade died on 17 April 1990 at age 61. [S903] Find A Grave - A User-Contributed Listing of Cemeteries and Memorials; Find A Grave Founder Jim Tipton, 2009; online at http://www.findagrave.com/cgi-bin/fg.cgi?page=gs&, Riverside Cemetery, Grantsburg, Burnett Co., WI. [S14] 1920 (January 1) U.S. Census, Wood River, Burnett Co., WI, ED 53, Sheet 9A (stamped 125). [S15] 1930 (April 1) U.S. Census, Wood River, Burnett Co., WI, ED 7-23, Sheet 9B (back of stamped 284). [S16] 1940 (April 1) U.S. Census, Wood River, Burnett Co., WI, ED 7-24, Sheet 6B (back of stamped 154). [S903] Find A Grave - A User-Contributed Listing of Cemeteries and Memorials; Find A Grave Founder Jim Tipton, 2009; online at http://www.findagrave.com/cgi-bin/fg.cgi?page=gs&, Ellsworth Cemetery, Emmet Co., IA. [S15] 1930 (April 1) U.S. Census, Ellsworth, Emmet Co., IA, ED 32-7, Sheet 3A (stamped 165). [S16] 1940 (April 1) U.S. Census, Lake Belt, Martin Co., MN, ED 46-17, Sheet 6A (stamped 296). Elsie Rosburg is the daughter of Herman Fred Rosburg and Julia Elizabeth Ball. 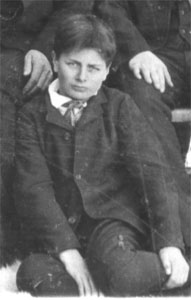 Robert Rosburg is the son of Herman Fred Rosburg and Julia Elizabeth Ball. Edwin S. Dawson is the son of Horace Lathrop Dawson and Ella Gertrude McClary. Donald W. Nelson was born circa 1918. He was the son of Allen Mack Nelson and Annie Elizabeth Downes. 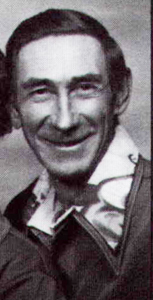 Allen D. Nelson is the son of Allen Mack Nelson and Annie Elizabeth Downes.